Coping with grief can be a deep and intimate challenge. Being able to accept, embrace and fully love one’s self and one’s feelings during a difficult time is not something we were taught in school, but it is something everyone must learn: to be able to cope with the deep sadnesses associated with the loss of a loved one or of something dear to one’s heart. Grief is a natural response to losing someone or something that’s deeply important to you. Feelings such as sadness, loneliness, despair and even depression can arise, and they can be caused my many different reasons. It’s important to understand that these feelings are natural and part of the grieving process, and to remember to not lose hope; rainy days are always eventually followed by sunshine, peace and even beautiful rainbows. Rather than resisting feelings of grief, love yourself enough to fully go through the grieving process, and use these 10 loving and proven ways to help yourself cope to make it through. You are loved, you can do it, and you are worth it. Grief is a normal human response to dealing with loss, especially the loss of a loved one. Grief can also occur after the loss of a pet, of a job, of a dream or a goal, or of a relationship. Grief can bring feelings of intense pain, sadness, anger, regret, disbelief and guilt. What once were fond memories can lead to tears, numbness, and physical exhaustion, as the person is so greatly missed and longed for. It’s important to remember that these are normal feelings that each person experiences in different intensities during the grieving process. Don’t be surprised by them, but rather accept that this is the body’s normal way of coping. Much of the stress encountered during the grieving process, outside of the loss itself, comes from resisting the normal, and sometimes painful, feelings that come up. By embracing the process as normal and allowing it to gently take place, we save ourselves from wasting energy trying to fight the feelings and stages of grief. There’s a myth people sometimes believe that if we ignore our feelings, or if we try and sweep them under the rug, that they will simply go away. While it’s possible to go on for a brief time like this, it is only delaying the onset of the natural process of grief. Eventually the pain comes out, and keeping it inside and not dealt with can lead to a troubled emotional state later on and possible connected physical problems. Your feelings are okay, and the sad part of you needs to be heard, seen, and loved. Be willing to face the pain and to admit that you are in real emotional pain inside. Start with yourself, and include sharing your feelings with trusted family members or friends who can love and support you. Many people going through great loss believe it’s in their best interest or in the interest of others to put up a strong front and to act like they are emotionally fine. They may be too embarrassed or ashamed to cry, and to be seen looking sad. This is the time to remind yourself that you are going through a serious emotional event, and that you yourself deserve to be taken care of and to feel all of your feelings fully: the sadness, the hurt, and the pain. Rather than acting tough, spend some time being tender with yourself. Give yourself a few days off. Sit in nature while listening to beautiful and peaceful music. Let the tears come if they want to. Sit in a warm bath or watch a comforting movie. Treat your own feelings with extra amounts of love and allowance, and be accepting of everything you feel, no matter how “weak” it may seem. Mourning is the outward expression of grief, and is a way to express the sadness with others who are also grieving or who can help support you. Mourning usually takes place in different forms, but whichever it takes, it’s a critical process that helps us to lessen the intensity of the grief and also to adapt to the loss. Cry if you want to, and don’t cry if you don’t want to. There’s no limit to how many tears a person should or shouldn’t cry. Simply if you feel like crying, allow yourself to do it. People will understand, and you are loved. There are typically 5 stages associated with the grieving process: Denial, Anger, Bargaining, Depression and Acceptance. Denial can occur after first learning of a loss. We can feel shocked, or think “this isn’t happening,” as our minds seek for a temporary way to deal with the rush of overwhelming emotion. The anger stage can happen after extended periods of feeling frustrated or helpless, as we sometimes become angry at life or at the people whom we lost. This is natural and normal and will pass. Bargaining is the stage when we dwell on what we could have done to prevent the loss. Thoughts such as “If only…” and “What if…” arise as we seek to find a solution to what happened. It’s more than likely that everything was out of your control, so don’t put too much of the weight on your own shoulders. Depression can occur as the sadness sets in and as one beings to understand the loss and its effect on their life. Symptoms of depression can include loss of appetite, problems sleeping and feeling overwhelmed and severely lonely. Acceptance is the final stage of grief, and is one where the reality of the loss is accepted. It is understood that it cannot be changed, and although the sadness still remains, you’re able to begin moving forward with your life. Each person goes through some or all of these stages in their own way, in different orders, in their own times. As grief can result in extra stress, disrupted sleeping and eating patterns, and loss of a general interest in everyday activities, it’s very important to do everything you can to love and support yourself. Be conscious of your health and daily habits. Do your best to eat healthy food and to get enough sleep each night. Exercise is also a great tool to use, as exercising helps the body release pent up stress and to receive all of the feel good hormones. It’s also recommended to stay away from alcohol during the grieving time until you feel more stable, as alcohol is a depressant and can keep the body from accurately feeling its feelings, as well as lowers the immune system and depresses a person further. Try a new routine to lift your spirits. Go outside, as studies have shown that sunshine makes people feel happier. Meditate to find inner strength, peace of mind, and to focus on the heart and the love within. Practice gratitude for everything in life that you still have to be grateful for. Write in a journal once or twice a day during this time to help yourself process, reflect on and understand your feelings. Writing in a journal can help bring clarity to what may seem like dark and confusing feelings. It can be normal to feel alone during times of grief, and even normal to want to avoid people altogether. However, the support of loving friends, loving family members, and loving spiritual leaders can be fundamental in helping us move on and healthily process the loss of a loved one. Find someone you trust whom you can talk to, someone who can listen. That’s a big reason you have family and friends, isn’t it? Your friends and family are here to be a shoulder to cry on, to be a kind ear to listen to your feelings without judging, and to give warm hugs when you need them the most. If you don’t think you have anyone close with whom you can trust in sharing your feelings, call a local lifeline as there are thousands of trained professionals who are available now to lovingly listen to your feelings anonymously, and for free. We usually aren’t in our most stable or best state of mind while experiencing serious loss, so delay any big decisions until you’ve fully gone through and healed from the grieving process. Wait until you feel calmer and more rational. Sometimes we may think it’s time to quit our job, to get a divorce, or to do something dramatic, but it’s very important to take the necessary time to heal and then to reflect on if this really is the best course of action you should be taking. When we are feeling good and in a good state of mind, we tend to make the best decisions, so put off making any big decisions until you’ve had a chance to process the grief and sadness fully. Self love and self compassion can be one of the biggest steps between having our feelings grow in a positive direction or having feelings bring us further down. With each wave of sadness, pain, hurt, anger or depression that comes, practice sending that part of your inner self lots of love from your heart. Love has the power to embrace, comfort, relieve and to heal painful feelings. Sit in a quiet space, and focus on feeling the feeling of love in your heart. It may take a while at first, but once you feel the feeling of love, send it to the parts of your self that are hurting, and allow the love to come into and to comfort all of the parts of you that are experiencing pain. Repeating affirmations can be helpful, such as, “I love the part of myself that is hurting. I love my hurt self.” When you finally begin to feel your love for these hurt parts of yourself, the amount of relief and relaxation felt can be profoundly healing. When dealing with severe loss, the help of a professional can make a serious and healthy difference. Psychologists are trained to help us safely share and process our feelings, and to help us understand what we’re going through and how to cope with it. Whatever level of grief you may be experiencing, love yourself enough to set two or three appointments with a well reviewed counselor in your area, and share your feelings with someone whose career is based on helping people feel better again. Remember that grief is unpredictable, and the times it takes to process are different for everyone. Rather than moving along in a straight line, grief tends to be more of a cycle that comes and goes as memories of the loss surface. Accept that feelings of pain and sadness will come and likely come again, and that this is normal and okay. Grieving is a process, it’s unique to each person, depending on their personality and their relationship with the person they lost. The intensity of the feelings will eventually subside over time, so do your best to take care of yourself and to accept, embrace and love your feelings in the meantime. 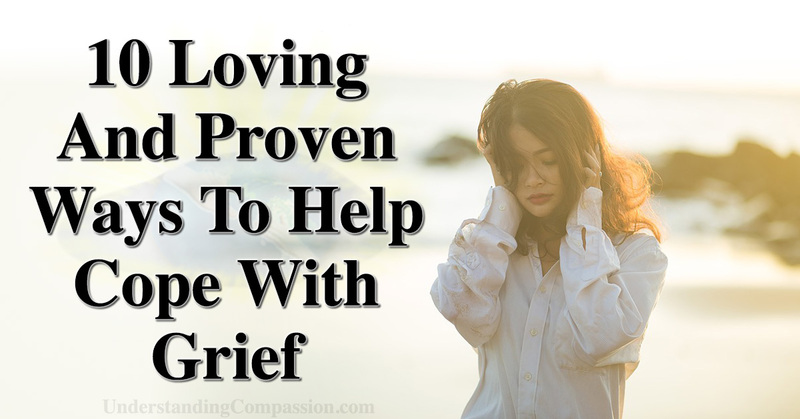 Have any of these 10 Loving And Proven Ways To Help Cope With Grief helped you in the past? You can do it. Keep going. You are Loved.